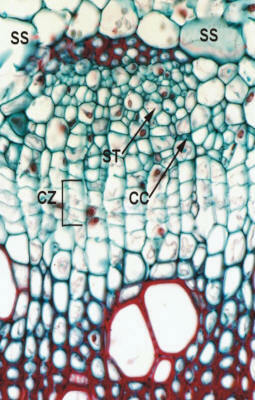 The micrograph shows a detail of part of one vascular bundle which is undergoing secondary growth. The cambial zone (CZ) is actively dividing and is several cells wide, but does not contain significant numbers of secondary phloem elements. The primary phloem strand contains sieve elements (SE) and companion cells (CC). A starch sheath (SS) delineates the cortex (above the starch sheath) and the stele (below the starch sheath). Click here for a more detailed look at the primary phloem. Click here for a more detailed look at secondary phloem.